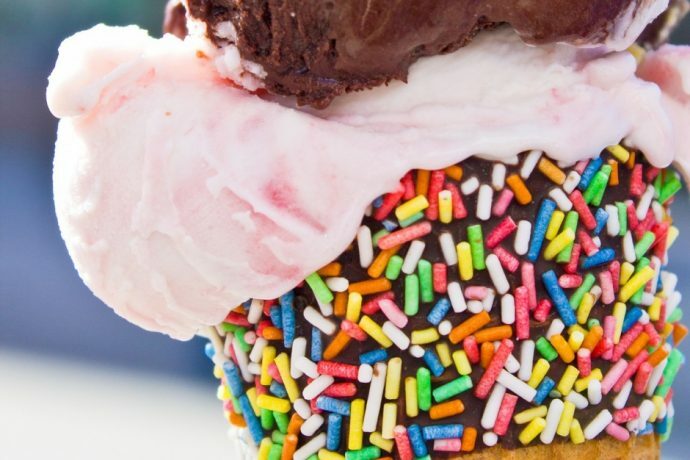 If you’re ever craving delicious gourmet homemade ice cream or other sweet frozen concoctions to cool yourself down while out and about Anna Maria Island, Two Scoops is where you’ll find them. With a location on Bay Blvd by the City Pier and trolley stop, this dessert shop is often packed, and not just because of the convenient access. Two Scoops is popular because of its unique and enticing ice cream flavors as well as several other made from scratch dessert choices such as sundaes, banana splits, shakes, along with a full breakfast and lunch menu full of traditional American favorites. Two Scoops first opened in 2007 and has become locally famous for its innovative and delectable flavors that lure in dedicated fans from everywhere. Where else can you get fresh homemade eggnog, “Trash Can” (Oreos, Snickers, Reese’s, and other candy bars mixed in), and blueberry pie ice cream? If you aren’t craving ice cream at the moment, the menu is vast and other options for desserts include a selection of signature sundaes, milkshakes, malts, floats, ice cream cappuccino, and sorbets. There’s a total of 32 original flavors available at Two Scoops, and you can always taste a few different options and purchase a pint or quart of your favorite flavors to take back to your Anna Maria vacation home. Two Scoops specializes in homemade ice cream and desserts but don’t overlook their food menu as well! On the breakfast menu, you can find their version of the McMuffin and McBagel, a two eggs breakfast, fried egg sandwich, French toast, Belgian waffles and other choices. The lunch menu offers even more variety with a selection of sandwiches including grilled cheese, ham, BLTs, roast beef, hot dogs, bagel sandwiches, and chili and hoagies. Breakfast and lunch are served all day and the prices for are some of the best that you’ll find in the area, with substantial portions. Several types of candy and popcorn are also available at the shop for some additional treats to take with you after you leave. The store also sells its own custom line of t-shirts, so be sure to pick one up or order one when you’re there and they’ll even post your photo of you wearing their shirt on their Facebook page! You can easily walk to Two Scoops after exploring the nearby historic City Pier, and there are also plenty of other attractions to see along Pine Street such as the Historic Green Village, Historic Anna Maria Jail, art galleries, and clothing boutiques. It’s a perfect place to get some A/C and cool down after walking around, with plenty of spots to sit outside and inside, so stop by Two Scoops anytime you’re near the City Pier or Pine Avenue!